Although not every scientist agrees, emissions of carbon dioxide from the combustion of fossil fuels, mostly petroleum, natural gas and coal are considered to be a major factor in causing the onset of global warming. Unacceptable rises in temperature are leading to rising sea levels from the melting of polar ice and corresponding climate changes may effect plant and animal life in otherwise temperate zones. Technological advances reduce the growth in energy demand to around 1% below the rate of economic growth, but the world’s demand for energy is expected to continue to rise exponentially, particularly in respect to emerging economies such as China and India. What is desired is a number of renewable sources of energy, not limited by resource depletion (as is the case with fossil fuels) and that are “clean” in that they emit little or no so-called “greenhouse gases”. Renewable sources include wind and sea current power, but there is a so-called “renaissance” in nuclear power, which is purported to meet both criteria. A rising awareness of the imminence of a peak in crude oil production together with the increasing demands for energy of the developing economies, together with concern over climate change has stimulated interest in the replacement of stations due for closure, extension of the operational life of some and the building of new stations. A nuclear power station of 1000 megawatt electrical generation capacity (1000 MWe or 1 gigawatt electrical = 1GWe) with a load factor of 0.9 requires around 200 tonnes (metric tons) of uranium per annum. For example, in 2008 the United States had 104 operating reactors with an average generation capacity of 972 MWe which are expected to consume 18,867 tonnes of natural uranium equivalent in 2009. Uranium production is subject to the same “Hubbert” cycle which characterised US oil production, which peaked in 1970. In spite of improved extraction technology oil production has declined since then, so that currently around 65% of US oil demand is imported. An individual uranium mine provides a rapid build-up followed by uniform production over 5 –10 years after which it declines and is closed. To maintain supply a series of mines have to be opened in succession. As the propensity of prospective new mines in respect to the depth and ore grades tends to be progressively lower, the succeeding mines require ever greater energy inputs for the same production. In consequence the aggregate of the individual mine supply curves produces a world “Hubbert” peak in uranium production which will eventually limit the level of “once-through” nuclear power generation, whereby spent fuel is not re-cycled. This limit was recognised from the inception of nuclear power resulting in several abortive attempts to develop fast breeder reactors and waste recycling processes. In December 2002 ten nations produced “A Technology Roadmap for Generation IV Nuclear Energy Systems” which concluded that to extend the nuclear fuel supply into future centuries it will be necessary to recycle used fuel and convert depleted uranium rejected from the enrichment process to new fuel. Six types of reactor were considered, three of them fast, each requiring US$ 1 billion to take to a demonstration phase in 2025. The authors found it impossible to choose between the six options and recommended “crosscutting R&D” between rival participants. (1) However, from the six types, two have been selected for implementation, one very high-temperature reactor for hydrogen production and one fast reactor, constituted as a "burner" to reduce waste rather than as a "breeder" to provide fuel supply sustainability, the development of which appears to be abandoned. MIT’s study “The future of nuclear power” opted for the “once-through” mode in which discharged spent fuel is sent directly to disposal. The team believe that “the world-wide supply of uranium ore is sufficient to fuel the deployment of 1000 reactors over the next half-century”. In an appendix (5.E) they argue that the extraction of low concentrations of uranium in phosphate deposits will suffice for a programme ending with a “1500 GWe scenario” by mid-century. (2) In any case, in the USA reprocessing is prohibited and spent fuel resides in ponds until it is "cool" enough to be placed in dry casks, then stored in the open. Whether the contents of the dry casks end up stored in the ultimate geological underground repository under Yucca mountain is now uncertain, as the project is suspended.. The World Nuclear Association (WNA) also recognises that regular mined supplies of uranium are limited and sees the survival of its industry in the universal occurrences of uranium in the earth’s crust and in seawater. In judging the sustainability of nuclear power the continuing availability of its uranium-based fuel is the main consideration. As will also be shown, the carbon emissions from the overall nuclear fuel cycle are inversely-exponential to the grade of ore from which its uranium source is extracted, the lower the grade, the more energy to retrieve it is needed and the more carbon dioxide is emitted. 2. Could all our energy be supplied by nuclear power? Before considering alternative sources, it is necessary to understand the size of the problem by examining current global energy consumption. Energy units exhibit little uniformity, but the joule can be used as a universally acceptable basis for analysis. Big numbers have to be employed to express global energy parameters, i.e., the exajoule (joule x 1018) and the petajoule (joule x 1015), abbreviated as EJ and PJ respectively. The world’s primary energy consumption in 2008 was 473 EJ, of which 88% was provided by fossil fuels. Of this 72.7 EJ was in the form of electrical energy (20,202 TWh), with 9.4 EJ (2,601 TWh) which is 13.0% of it provided by nuclear generation. If not restrained by uranium supply problems, nuclear power could in theory substitute for gas and coal for all the world’s electricity generation, but electricity is not readily adaptable for mobile transport. Transport constrained to fixed guide systems, such as rail and tramways can use electrical energy directly from current collectors, but mobile transport able to move on roads or rough terrain uses mostly liquid fuels derived from oil. As oil reserves deplete, liquid fuels will be synthesised increasingly from natural gas and then coal, until all fossil fuels able to be economically extracted are exhausted. To use electrical energy as an alternative to conventional liquid fuels for mobile transport requires the production of hydrogen from electrolysis and its subsequent cryogenic liquefaction for on-vehicle storage. This has an inherent energy penalty over the derivatives of primary fuels and of course, unless the electricity used to produce the hydrogen fuel is from a renewable and “clean” source, offers no panacea to global warming. Assuming mobile transport requires 40% of global primary energy (473 x 0.4 = 189 EJ) and taking into account the energy efficiency of a diesel engine at 46%, the useful energy is 87 EJ. Taking into account the lower heating value of hydrogen (120 MJ/kg), this is equivalent to 725 x 109 kg H2, which to get in its liquid form requires by electrolysis and liquefaction 75 kWh/kg equivalent to 54,375 TWh, which at 34% generation efficiency requires 576 EJ of primary energy. So if transport could be based on a hydrogen economy the primary energy requirement for global electrical generation rises from 473 EJ to 860 EJ. (i.e., 473 -189 +576 = 860) The problem is that electrical energy of whatever means of generation is a poor substitute for the adaptable primary energy obtained from fossil fuels. Assuming world economic growth of 3%/annum, with growth in energy requirements 1% less, extrapolating from 2008 to 2020, increases the energy requirement to 1090 EJ. Even this amount of nuclear primary energy may be insufficient as it is unlikely that nuclear power plants could be sited next to factories and housing schemes requiring just heat, so the energy would have to be transmitted and used as electricity. A typical 1GWe nuclear power plant produces 85 PJ of primary energy per annum, so to provide for 860 EJ around 10,000 1GWe (or 6,000 Areva 1.6 GWe EPR) nuclear power stations would have to be built. To provide for 1090 EJ would require 13,000 1GWe (or 8,000 Areva 1.6 GWe EPR) stations. Each 1GWe station requires 200 tonnes/annum of natural uranium for the manufacture of its fuel. So to fuel the primary energy requirements of 860 EJ and 1050 EJ would mean the production from mines of around 2 million tonnes/annum or 2.6 million tonnes/annum) of uranium respectively. From the above projections it is clear that nuclear power has no chance of matching the coming energy deficit by supplying the needs of an equivalent hydrogen economy to that currently sustained by fossil fuels. Even if there was sufficient uranium to fuel it, the building of a parc of 8,000 to 13,000 nuclear power stations would be an impossible prospect. The processing and sequestering of the consequential enormous volume of radioactive waste would be also be an impossible task. 3. Can the world’s electrical energy be supplied by nuclear power? The MIT team have produced a more modest plan for the building of power stations to provide 1,500 GWe of nuclear generation capacity by 2050, which would provide 13,140 terawatthours per annum (TWh), about a third only of the anticipated global total electricity consumption of 39,000 TWh in 2050. The uranium requirement for their programme over the 45 years from 2005 to then amounts to 9.5 million tonnes. In 2050, the uranium demand would be 306,000 tonnes/annum, which would require a 7-fold increase in current mining production rates. But they assume a total uranium consumption for their scenario of 17 million tonnes, because the average remaining life of the parc after 2050 would require a further 7.5 million tonnes. Uranium reserves of ore of a sufficiently high grade (see 5 below for a definition of this) were estimated at only 4,700,000 tonnes (but now exaggerated claims of 5.5 million tonnes have been promoted.) So to get round this difficulty, MIT compute that the reserves can be expanded to suit the requirement by progressive increases in the uranium price. They consider that ore deposits of grades between 0.001% and 0.03% would hold 22 million tonnes of uranium and would be viable at increased uranium prices without unacceptable consequent rises in the electricity price. However, with the processing of these low ore grades there is a yield loss and larger energy inputs, leading to a negative energy gain in the overall nuclear fuel cycle. World phosphate mining results in 150 million tonnes of phosphogypsum accumulating every year in diverse locations as a waste product containing 10-20 ppm of uranium. If the uranium was extracted it would only produce 1,500 to 3,000 tonnes of uranium, so its production as a co-product does not seem a viable possibility. The scale of such inconceivable operations and the commensurate input energy provided largely by fossil fuels is totally non-viable. MIT has failed to give the location of the low grade deposits of uranium ore on which their programme depends or to examine the methods of extraction and the energy consumption related to the ore grades assumed. There is no chance that a parc of 1500 GWe of nuclear power plants, providing only one third of the projected electrical energy consumption in 2050, can be fuelled. 4. Is there enough uranium to supply the currently operating nuclear stations for their remaining years of operation? There is a current world building programme of around 52 new stations, with some 135 further stations on order or planned. Some existing stations are having their operational life extended and some are now being de-commissioned. The Fukushima incident has had a profound effect on uranium supplies. The revised 2011 (equivalent) uranium fuel demand of 62,552 tonnes/annum was required by 434 operating stations averaging 853 MWe capacity each.. The secondary sources of uranium, consisting of ex-weapons material, ore stocks, re-worked mine tailings and a modicum of mixed-oxide, which provided 33% of the fuel demand in 2008 and expected to be exhausted by 2013, only provided 14% of the demand in 2011. Since Fukushima the uranium price has fallen, restricting investment in new mines. The Areva Namibian mine Trekkopje, destined to supply new nuclear build in China, is disappointing expectations. As many of the operating stations in Japan and Germany have now closed, it remains to be seen how the fuel supply will mature, depending on how many will have become obsolete and closed, how many have their operation lives extended and how many are built and commissioned in the intervening period. The end of the price competition from secondary sources might intensify mining activity and lead to a resurgence in production, but to open new mines, always assuming that suitable opportunities emerge to locate them, will take more than the intervening years. The current demand/supply situation is best illustrated by Table 1. Unsurprisingly the USA, the world’s largest consumer of oil and gas, turns out to be the biggest consumer of uranium. The USA consumes 25% of the world’s oil production, 25% of its gas and takes 29% of the world’s available uranium, while producing only 9.0% of its requirements from its own mines. The figure of 18,376 tonnes of natural uranium shown for the US is an equivalent. Half of the fuel consumed is imported from Russia under the Megatons to Megawatts agreement as uranium hexafluoride, made by blending ex-weapons highly-enriched uranium with re-enriched enrichment tails, requiring a large capacity in seperative work units (SWU), which the Russians possess. The release of US ex-weapons HEU also occurs, but its diluting to fuel grade low enriched uraniun (LEU) relies on new centrifuge facilities, the state funding of which has been suspended. The agreement is set to terminate in 2013 and, as can be seen from Table 1, Russian internal supplies are in deficit and it is unlikely to be renewed thereafter. There is a tentative agreement for the 'limited' import of Russian low enriched uranium as a follow-up, but this merely allows it to enter the US, not guarantee its supply. France ranks second and relies on nuclear power for 76% of its electricity. But since its own mines are now worked out, it is the most insecure. Japan ranks next followed by Germany, Russia, South Korea and the UK. The combined uranium consumption of the principle eleven nations with nuclear power totals 50,282 tonnes (80% of the supply), compared with their own primary mining production in 2010 of only 15,865 tonnes (29.6% of the primary supply). A parc of around 450 GW of nuclear power stations, maintained by the replacement of ageing reactors and the building of yet more, would require a supply of 90,000 tonnes/annum, so that mining production will have to double in the next 7 years – an unlikely prospect. In Canada, the leading supplier of uranium, two mines have closed and two of the three operating uranium mines have passed their “Hubbert” peaks as is shown in the plot below. (7) For production to remain at its 2005 level a series of new mines will need to be opened. Canadian primary production was 11,597 tonnes in 2005, falling to 8,786 tonnes in 2009. Later production was boosted by secondary production from low grade tailings. The reason for the severe drop in Canadian production is the failure to open the new Cigar Lake mine due to catastrophic flooding while the McArthur River mine may have started its Hubbert decline. To maintain constant production a series of new mine openings is required. Meanwhile in 2006 in Australia, production (7,593 t U) was 20% below its level in 2005 (9,516 t U) due to the decline in grades at the Olympic Dam underground mine and the flooding of the Ranger mine, recovering somewhat in 2007 (8,611 t U) and in 2008 (8,430 t U) at 11.4% below that in 2005. The replacement of the Olympic Dam underground mine by an open pit is not due to start until 2014. If it goes ahead the first ores will be reached in 2019 after 5 years of excavation to remove 2 billion tonnes of rock. The closure of the Ranger mine is likely to be avoided as a feasibility study into its possible continuation is underway. The recent rise in world uranium production is due to the rise in Kazakhstan, but this may be a temporary phenomenon as the ISL method offers a rapid build up followed by an equally rapid decline. However its production is pre-sold to China, Japan, Korea and Russia. As there seems little chance of replacing the entire lost secondary sources or stemming the decline in primary mining production, a shortfall in fuel supply seems inevitable and the nuclear contribution of electricity generation will progressively decline. 5. Is nuclear power “clean”? Then the claim for the carbon-free status of nuclear power proves to be false. Carbon dioxide is released in every component of the nuclear fuel cycle except the actual fission in the reactor. Fossil fuels are involved in the mining, milling, conversion and enrichment of the ore, in the handling of the mill tailings, in the fuel can preparation, in the construction of the station and in its de-commissioning and demolition, in the handling of the spent waste, in its processing and vitrification and in digging the hole in rock for its deposition. The lower the ore grade, the more energy is consumed in the fuel processing, so that the amount of the carbon dioxide released in the overall fuel cycle depends on the ore grade. Only Canada has ores of a sufficiently high grade to avoid excessive carbon releases and to provide an adequate energy gain. At ore grades below 0.01% for ‘soft’ ores and 0.02% for ‘hard’ ores more CO2 than an equivalent gas-fired station is released and more energy is absorbed in the cycle that is gained in it. Ores of a grade approaching the “crossover” point such as those in India of 0.03%, if used, risk going into negative energy gain if there are a few “hiccups” in the cycle. The Olympic Dam mine in Australia, described as potentially the world’s largest uranium producer, survives as a co-producer of copper, silver and gold, but even so the uranium ore grade averaging 0.04% is below the current industry “cut-off” point of 0.08% for economic viability. The future of the mine is the subject of a feasibility study into its conversion from an underground to an open pit 3km x 3km x 1km deep, but the owners have stated that without the copper the expansion would not be considered. As the price of diesel rises, the incentive for Australians to import expensive oil to provide others with nuclear energy reduces and with it a large potential for emissions of carbon dioxide. When the energy inputs, past, present and future are totalled up and set against the actual energy derived from the entire nuclear power programme and its waste handling, it may well be that the overall energy gain has been negative. This has been masked by the availability of cheap fossil fuels, but as that era passes it behoves energy professionals to make an honest assessment of the energy and monetary economics of proceeding further with a failed technology. In the UK in 2006 the government's Energy Review concluded that nuclear power can only be economic if its claimed low carbon status allows it to sell its "carbon credits" to carbon-emitting generators requiring an off-set. As fossil fuels will be considerably depleted before the operational cycles of the proposed new fleet of nuclear stations end, the generators are asking for guaranteed carbon credits for a 100 years to justify their investment, in effect demanding a subsidy. Some politicians reckon the world needs need to stop 80% of carbon dioxide emissions, but even if nuclear power is considered to be carbon free it only provides 26 EJ, i.e., 5.5% of the current world primary energy or 2% as electricity. So there is no possibility of an expansion of nuclear capacity solving to any significant degree the problem of global warming. It is claimed that nuclear power meets the two characteristics of sustainability and zero or low carbon dioxide emissions and so might be able to substitute for fossil fuels once they are exhausted and in the meantime to avoid release of some greenhouse gases. The claims are baseless. In conclusion, perhaps the scale of global warming has been overstated by omitting to take into account fossil fuel depletion. A guide to the maximum amount of carbon dioxide released from the combustion of fossil fuels can be calculated, given that they are limited. 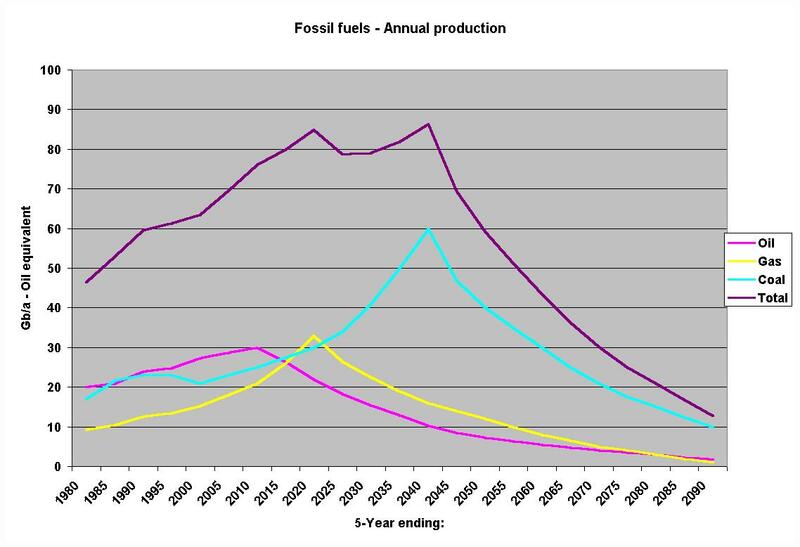 The graph below shows that if economic growth continues as currently, the reserves of oil, gas and then most of the coal will have emptied by the end of the century. From a knowledge of the carbon content of the three fuels, it is then possible to work out the total amount of carbon dioxide likely to be released. This comes out as 5 exagrams or 5,000 billion tonnes. An earth scientist should be able to work out the temperature rise that the release of this limited amount, mostly over the next 50 years, is likely to produce. Before hampering the world with useless measures unable to reduce the eventual amount of the release of carbon dioxide, it would be more appropriate to estimate the ultimate consequences of today’s immoderate exploitation and exhaustion of fossil fuels. The real problem the world faces is the depletion of fossil fuel reserves – the very same depletion will ease the carbon burden of the atmosphere by an inexorable emptying of its energy resources by the world’s economies.